Time Machine, new with Leopard, is an effortless way to back up everything on your Mac. You can go back in time to retrieve a file that was lost, damaged, or changed. To use Time Machine, you need to have an extra drive that’s big enough to store what’s on your computer. Time Machine pretty much takes over from there. It automatically keeps backups every hour on the hour for the past 24 hours, and daily backups for the past month. Beyond that, Time Machine goes weekly, at least until the backup drive is full. To set up Time Machine, plug in your secondary hard drive. When your Mac asks whether you want to use it for a Time Machine backup, click the Use as Backup Disk button. This step is really all you need to do, unless you want to customize which files are backed up. The Mac begins dutifully copying everything on the computer, including system files. This first copy job is likely to take awhile, especially if your Mac is stuffed with files. (It’s okay to do something else — like sleep — while the files are copying.) Subsequent backups are a lot quicker because by then the Mac copies only what’s changed, such as edited documents. The remarkable thing about Time Machine is that it captures multiple copies of your files. This allows you to go back in time to see what a file or folder looked like on the day it was backed up, using Quick Look if you want a quick preview. For example, say that you’re looking at the batch of photos that make up the Last Import folder in iPhoto. When you go back in time with Time Machine, you’ll see how the Last Import folder changes on different dates. 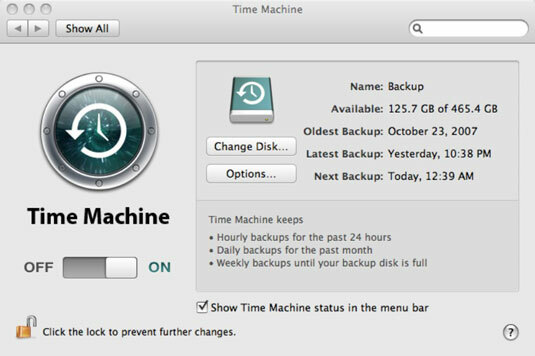 Although Time Machine is initially set up for automatic hourly backups, you can arrange an immediate backup. Hold the mouse on the Time Machine icon in the dock. Select Back Up Now on the menu that pops up. If your secondary hard drive is full or you have stuff you want to keep private, you can omit certain items from being copied. Open Time Machine preferences and click Options. Then click + to add the files that you want to exclude, or drag items onto your no-backup list. You can also turn Time Machine off altogether in Time Machine preferences by sliding the off-on switch to the left. But why would you want to? Apple sells a wireless companion for Time Machine called Time Capsule. This backup appliance combines a Wi-Fi base station and secondary hard drive. It comes in 500GB ($299) and 1TB ($499) versions.